Four batches of muffins. That’s what it took to perfect this dreamy cherry muffin recipe. I’m really happy with the results of this last batch. You won’t find any chunks of fruit in these, even though I love them that way. 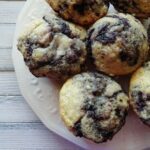 I can’t get any of my kids or my husband to eat anything with chunky fruit, so these fruity swirly muffins are my way of pleasing my family. The bonus is that I love them too! In my first couple of batches I tried drastically cutting the fat, but more often than not that results in a tough muffin. Yuk. I’d rather each less of a great thing than more of a “meh” thing. I also experimented with mixed berries paired with the cherries and that worked rather well too. You may substitute other fruits such as strawberries, peaches, mixed berries or blueberries. You can also use fresh fruit if you like. Cherries paired with almond flavoring is a match made in heaven. So it was only natural to use almond extract in addition to the vanilla, but you could leave the almond out if there are any allergies you’re concerned about. 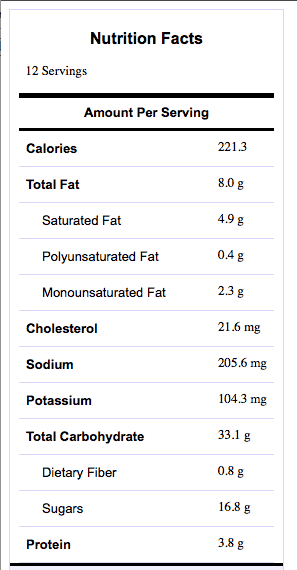 Each muffin has 221 calories and 8 grams of fat. Not great, but not really too bad either. Instead of sprinkling sugar on top of these, you could simply leave them plain or drizzle them with some powdered sugar glaze. But the tops are so pretty all swirly and such, I didn’t want to cover them up. I hope you try these. I’m really pleased with the results. I hope you will be too. Be sure to stop back and let me know if you do! It’s pretty easy as recipes go. You combine all the dry ingredients in one bowl, whisk the wet in another bowl then add in the melted butter. Combine them and stir until no more dry ingredients show. Then run your cherries through a mini food processor. 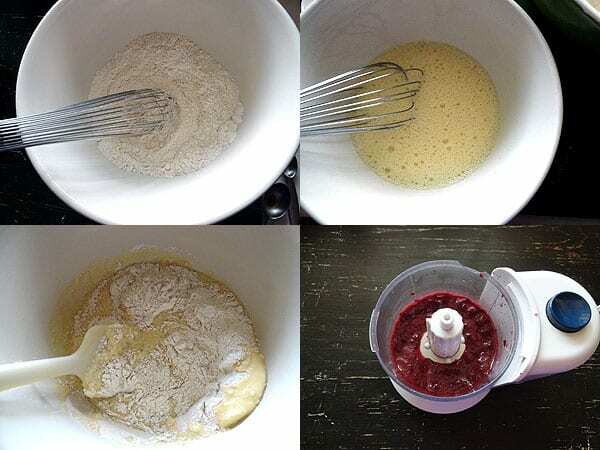 Distribute the batter among 12 muffin cups and add a dollop of whirred cherries on top, about a heaping half a teaspoon. Use a butter knife or the handle of your teaspoon to swirl the fruit into the batter. Don’t over swirl it, that’s called mixing. :) Just a few turns back and forth is enough. Then finish off by sprinkling with sugar. Bake. Enjoy. Please keep in mind that if you make substitutions to this recipe it will change the nutritional information. 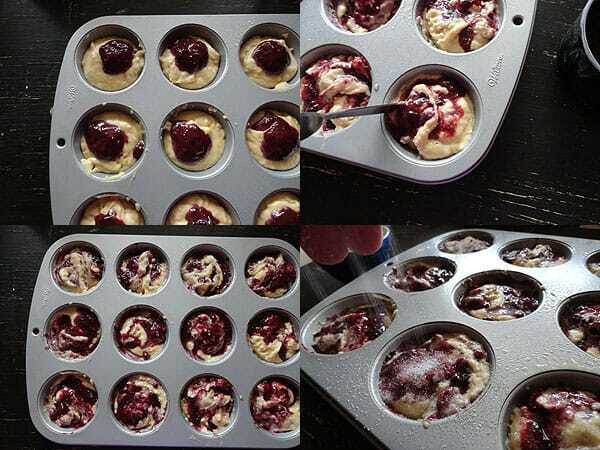 Preheat oven to 375 F. Lightly spray 12-cup muffin pans with non-fat cooking spray. In a large bowl, combine both flours, 3/4 cup of sugar, baking soda and salt. Whisk to combine, set aside. In a medium bowl, whisk the egg substitute, milk and both extracts until frothy. Whisk in the melted butter. Place partially thawed cherries in a mini food processor and process until smooth. Make a well in the dry ingredients and pour in the wet ingredients. Fold together until just combined. Distribute batter among muffin cups. 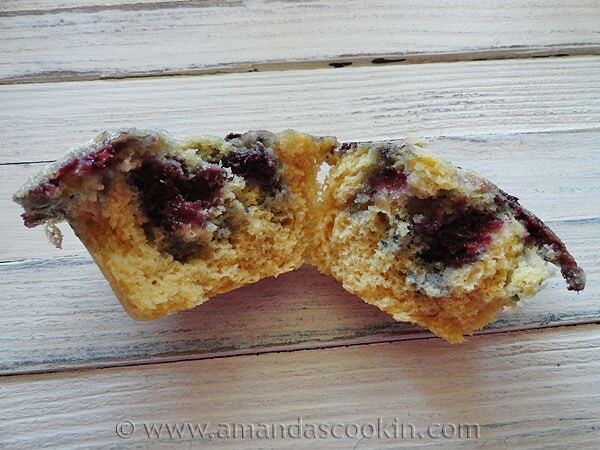 Add a heaping 1/2 teaspoon of processed cherries to the top of each muffin. Use a butter knife or the handle of your teaspoon to swirl the fruit into the batter. Don’t over swirl it, that’s called mixing. :) Just a few turns back and forth is enough. 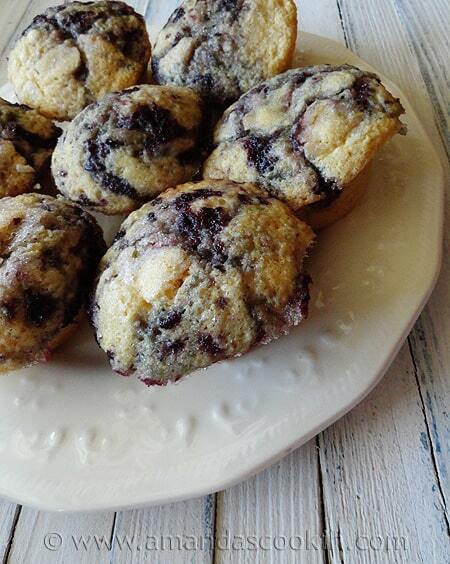 Using the remaining 3 tablespoons of sugar, sprinkle the tops of the muffin batter. Bake for 17-19 minutes, then remove to a wire rack to cool for ten minutes. Carefully remove each muffin and place on a cooling rack to cool completely. *Leave the fruit out long enough to soften them a little, but not long enough for them to be lying in a pool of their own juice. You may substitute other frozen fruits such as strawberries, peaches, mixed berries or blueberries. You can also use fresh fruit. Wow, these are beautiful and impressive. I love the idea of swirling the cherry mixture into the batter. mmmm, yum, these look delish! ohhh delish! 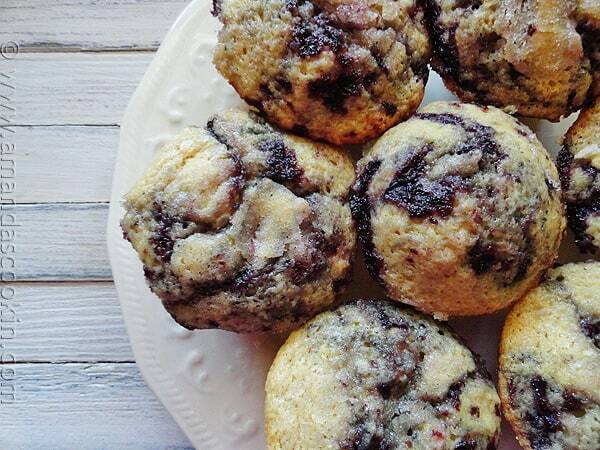 Fruit and muffins are made for each other. Like the changes you’ve made on your blog! These look terrific and I love the addition of the almond extract in these. So pretty! 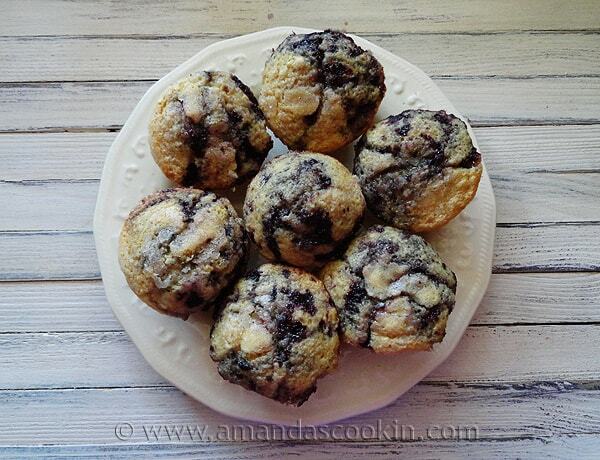 Beautiful muffins, Amanda! 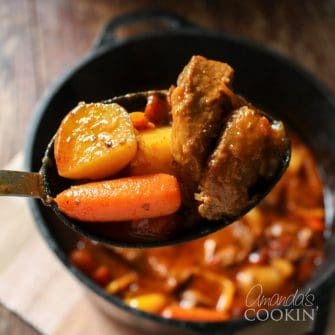 I’ll be trying this recipe for myself soon. 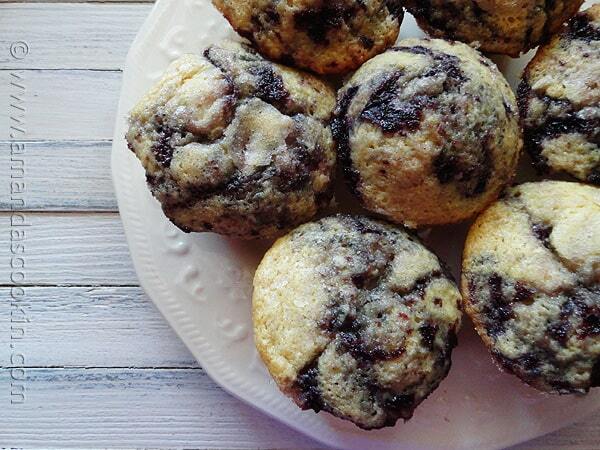 Beautiful muffins. I think these will be in my oven pretty soon. These look really good, Amanda. 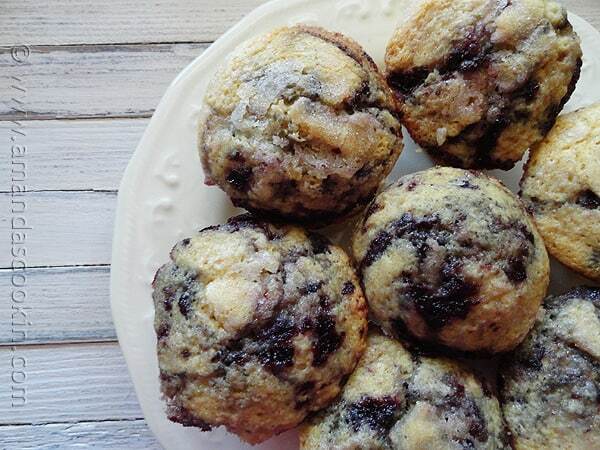 I’ll try them with applesauce in place of the butter — since that’s what we do with all our muffin recipes. Can’t wait to surprise my husband with these as he is a big cherry lover.